Happy New Year!! 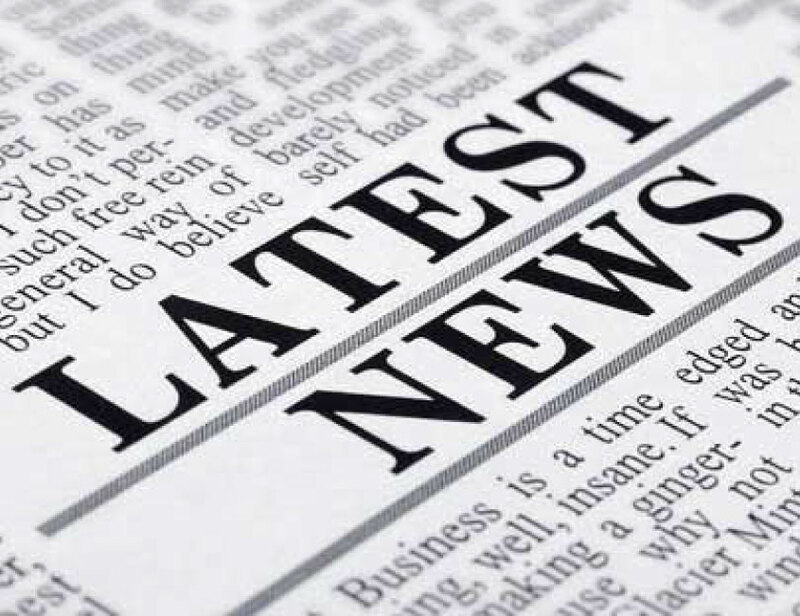 We have an exciting year of exhibits planned for you this year at The Clayton Center. This month we have the Women’s Club of Clayton presenting some amazing artwork from the children in Johnston County schools. Their artwork is a must see. The Student Arts Festival will be on display through January at The Clayton Center. Our program committees are gearing up for “Capture the Town” in May and the Mondo Roots Festival in June. Be sure to bookmark our new web address www.claytonvisualarts.org so that you can see all the upcoming Call for Artists!! 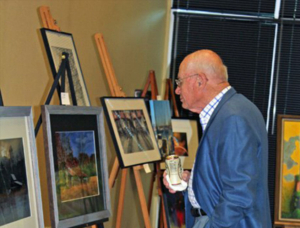 The 9th Annual Johnston County Art and Food Festival is set for Thursday, March 15th from 6:00 – 8:00pm at the Paul A. Johnston Auditorium located on the campus of Johnston Community College- Smithfield, NC. Tickets are $40 each or 2 for $75. Artists can enter one piece of 2D or 3D artwork for each ticket purchased. This is the Johnston County Art Council’s yearly fundraiser. There is also a call for donations for the silent auction. Email info@jcartscouncil.org for more information. Go here for prospectus and entry form. 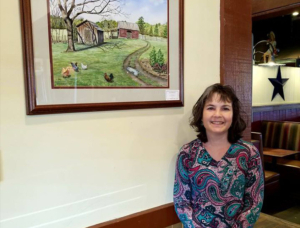 Catherine Donleycott has an exhibit of her watercolor and oil paintings at the Cary Bond Park Community Center. Exhibit runs now through February, including the February Final Friday reception on January 26th. 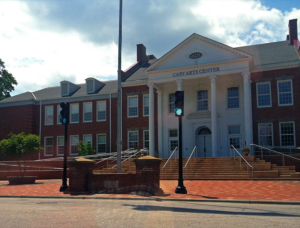 Bond Park Community Center is located at 801 High House Road, Cary, NC. 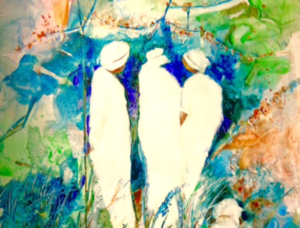 See Kathy Noble’s acrylics and watercolors at Skylines through January 16th. Following Kathy’s exhibit will be an exhibit by the Johnston County Art Co-op, of which she is also a member. Other CVA members are Jo Lee Tucker and Heidi-Lee Peach. 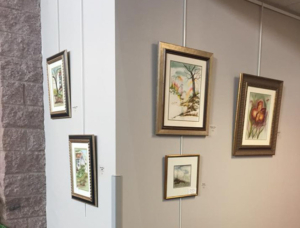 JCAC is a group of nine talented artists from Johnston County, working in mixed media, watercolor, acrylic, and photography. The co-op is located in Smithfield at 619 S Brightleaf Blvd, Suite C, Smithfield, NC. Skylines Cafe is located at 8878 US 70 Business Hwy W, Clayton, NC. CVA artists Nuttle & Crittenden have are part of Litmus Gallery’s Art to Be Treatured exhibit. Each artist has three small paintings for sale at Litmus Gallery in Raleigh. The show is through January 25th, and all works by various artists are $99 and under. 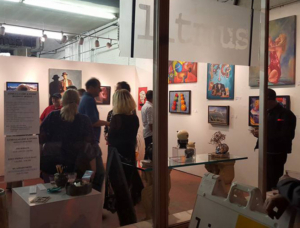 Litmus Gallery is located at 312 W Cabarrus Street, Raleigh, NC. Learn more at Litmus Gallery’s website. 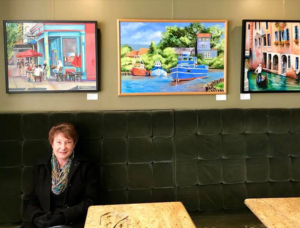 Janie Prete’s painting of Flip Side Restaurant, a past Paint-the-Town award winner, will be featured on tote bags for an upcoming Downtown Main Street Conference in March. The Town of Cary seeks artists to display in several venues. The Town of Cary announces solo and group art exhibition opportunities at Page Walker Arts & History Center, Cary Arts Center and other facilities around town. Artists working in any medium are invited to submit an application anytime. Application deadlines are February 1 and August 1. Go here to access the application.